THE TRADITION OF DOWNTOWN ICE SKATING CONTINUES! 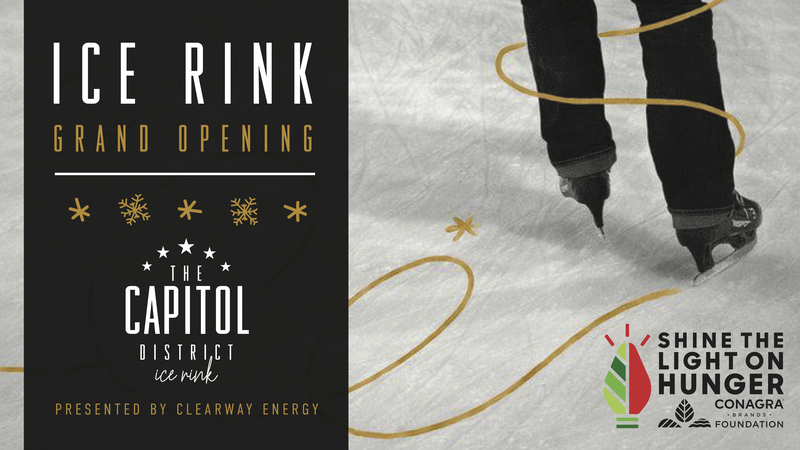 Help us celebrate the grand opening of The Capitol District Ice Rink presented by Clearway Energy, part of the dazzling downtown Holiday Lights Festival. Enjoy our 60’ x 120’ ice rink nestled inside Downtown Omaha’s modern town square at The Capitol District under the big screen! ADMISSION: $10.00 including skate rental and tax. A portion of proceeds will be donated to the Food Bank for the Heartland as part of the Shine the Light on Hunger campaign. Conagra Brands Foundation will match ice rink admission up to $100,000 for the campaign. Bring your non-perishable food items to the rink to help families in need. Look for the Shine the Light on Hunger collection bins! Delicious food and drink options surround the ice rink, and Holiday Lights Festival sponsor Blue Cross Blue Shield of Nebraska will be serving hot cocoa rinkside! The ice rink will be open December 7, 2018 through January 21, 2019.